Today we hike higher in the mountains of Cameroon and travel up Mount Oku where we encounter the most colorful chameleon in Cameroon, Trioceros serratus, appropriately nicknamed the Peacock Chameleon. This is a small chameleon and is about the size of the more well known carpet chameleon. T. serratus, and its similar cousin, T. perreti, used to be considered subspecies of T. wiedersheimi until they were elevated to species status in 2009. T. perreti has a smaller range on Mount Manengouba, while T. serratus has a much wider range including Mount Oku and even into Nigeria. Trioceros wiedersheimi remains as a full species. Its range is small and the species is rarely seen. 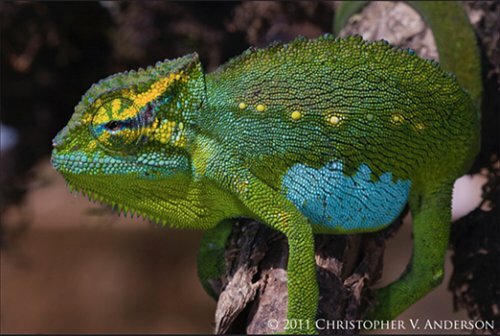 T. serratus shows a rich green color, with red, yellow, and blue highlights, but when a male sees a female we see the display that earns it the name Peacock Chameleon. Jurgen Van Overbeke has bred T. serratus and has found them an easy species to reproduce. There have been other reports that they are difficult to breed showing us how far we have to go in sharing how we have been successful. To this end, Jurgen shares his methods. “Trioceros serratus, the peacock chameleon, has done well for me in a densely planted terrarium. This is a common theme in keeping of the Cameroon species and T. serratus is no exception. They need their hydration and I give them night time high humidity + fogging with misting in the early morning and afternoons. They are montane species and so like their environment on the cool side. I keep mine up to comfortable room temperature maximum (mid 70s F/23C) and give them a nighttime drop to the low 60s F/17C. I keep them all separate and bring them together only for mating. From May to October they are in the garden and exposed to natural sunlight. Over the winter months I use a T8 5.0 UVB bulb and just a little vitamin supplementation. Like the other Cameroon species, T. serratus is sensitive to our supplementations and can develop edema quickly. Even with just calcium I have gotten a “soft” edema. I watch my chameleons every day to detect whether any edema is starting. If I see any soft “collar” starting I stop any supplementation until it goes down. I rely on heavily gutloaded feeder insects to give nutrition. As gravid females need calcium to develop eggs I am vigilant in my calcium supplementation. I have seen signs of edema even with just pure calcium dusted feeders after five every other day feedings. At this point I remove all supplementation for a week to ten days until the edema dies down. This is an easy to breed species and is quite prolific in egg production. The females lay 2-3 clutches a year of 6 to 12 eggs each. They have a two month long gestation period and, at 64-69F/18-21C, the incubation can be five to eight months. Sexual maturity is reached in about one year. The following species gallery comes from an expedition taken by Dr. Chris Anderson to Cameroon and to Mt. Oku where he captured these images of Trioceros serratus in situ.